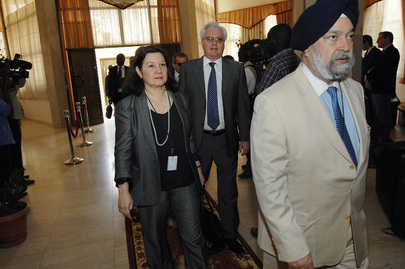 UNITED NATIONS, August 2 -- In the break between Tuesday's Syria sessions of the Security Council, Inner City Press asked the Council president for August Hardeep Singh Puri if the proposal made in the morning by Brazil was also on behalf of India and South Africa. His answer, as Indian ambassador, was that a request had been made to "marry" the Brazil elements with the UK's updated resolution. Condemn all forms of violence including the use of force against unarmed civilians, sectarian violence as well as hostility against security forces. · Call for a Syrian-led political process that is inclusive, with the aim of effectively addressing the legitimate aspirations and concerns of the population which will allow for the full exercise of fundamental freedoms, including that of expression and peaceful assembly. · Call for an immediate end to the violence and urge all sides to act with the utmost restraint, respect for human rights and international humanitarian law, and to refrain from reprisals. · Refer to actions already taken by the Syrian Government in launching dialogue as well as the reform measures already announced. · Urge the Government of Syria to expedite the implementation of these measures and to continue and expand the dialogue process. · Call on the Syrian authorities to comply with their international obligations under human rights and humanitarian law and to launch a credible and impartial investigation into the violence in Syria. In this regard all parties should be held accountable for violence perpetrated; be it the use of force against unarmed civilians, sectarian violence or hostilities against security forces. Note the "hostility against security forces" and "all parties" -- Hardeep Singh Puri spoke of 350 security forces killed -- and the crediting of the Syrian Government for reform measures already announced. Hardeep Singh Puri hearkened to the early years of the Council, from which India has been absent for 19 years, when he said there were no resolution or Presidential Statements, only "decisions." Just before the 3 pm resumed session of the Council, Inner City Press asked US Deputy Permanent Representative Rosemary DiCarlo about this history. "Something new every day," she said. Actually, something old. Hardeep Singh Puri said that attempts earlier this year for a Council statement on Syria were blocked by "that famous Lebanese sensitivity." He floated another way to get around that: agree to what are in essence elements of a Presidential Statement, which Lebanon could block, then convert them into a resolution -- which could because of its PRST-like language be acceptable to those troubled by how the Council's Libya resolutions have been implemented. Hardeep Singh Puri responded to repeated questions by saying that the Western perspective was not shared by the majority of the Security Council, but got "more resonance with those in this room" -- that is, the assembly media. And then he was gone.